In Summary: We took a look at 10 hose storage systems and decided that the Rapid Reel cart was the best garden hose reel. It’s the best because it has all of the bells and whistles you need. It’s sturdy, it’s portable, it’s made out of aluminum and more. The best advantage about this product was the 10-year warranty. Products that have warranties are favored because the company will cover just about anything that goes wrong. Retractable or Not? Garden hose reels may or may not be retractable. If you don’t want to manually put the hose around the reel yourself, you can get a retractable hose reel to do most of the work for you. Some may automatically roll the hose back on the reel for you. Others will have a handle to use. One downfall is that automatic retractable hose reels can’t help you with pulling out your hose when you want to use it. You’ll have to do that yourself. Another downfall is that reels sometimes have a hard time retracting the hose. Length. 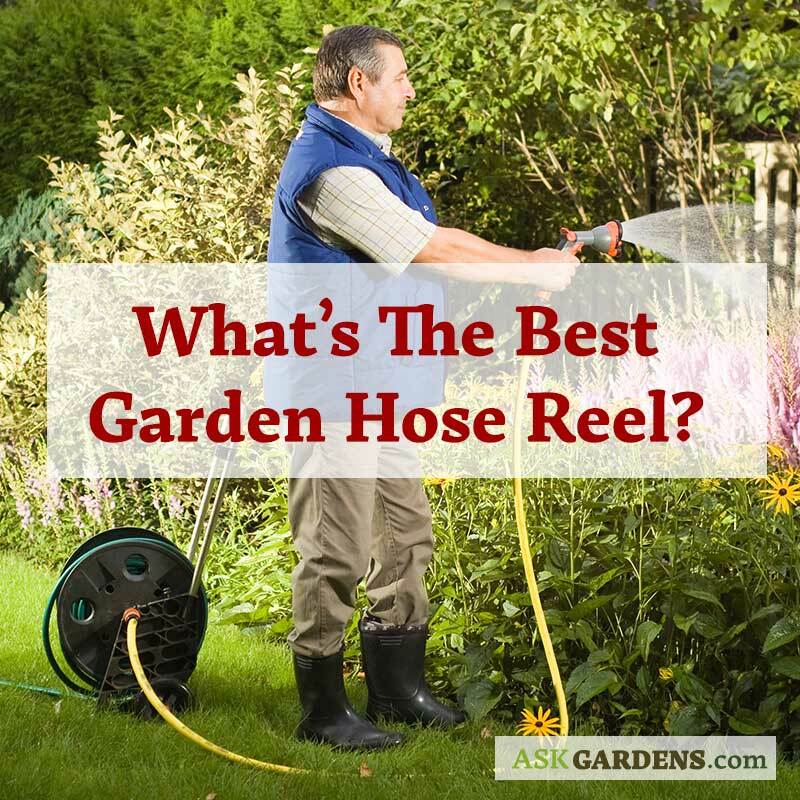 Before you consider any of these garden hose reels, you’ll need to find out how long your hose is. If you don’t take the time to see how long your hose is, you could buy a hose reel that isn’t big enough. If you want to be on the safe side, you should purchase a hose reel that’s considerably longer than your hose. Remember, your hose will get bigger when temperatures rise. Portability. Another thing that you’ll want to think about is how portable you want your reel to be. If you have a large yard, you may want to consider purchasing a garden hose reel that you can move around while you water. If your hose is long enough to water everything you need it to without moving it, a reel that’s affixed should be suitable. Safety. One of the biggest advantages of having a hose reel is safety. Many people seem to trip on their hose if they don’t have a reel. If you get a reel, you likely don’t have to worry about this issue any longer. The reel allows you to pull out the length you want without pulling out too much to cause accidents. Organization. Using a hose reel will reduce the clutter in your garden. If you purchase a hose reel, you’ll be more likely to use it since it’s easier to use compared to throwing your hose on the ground when you’re finished watering. Convenience. Like I mentioned previously, some hose reels will be retractable, and others won’t be. Purchasing a retractable hose reel is ideal if you don’t want to have to spend much time wrapping the hose up after you’re done. You’ll also save some energy too. Longevity. Using a hose reel reduces damage to a hose. The hose won’t have tangles and cracking. You’ll be able to reduce sun damage. You won’t have to purchase a hose as often, which will save you money. Protection. Instead of putting your hose on the ground after you finish watering, you’ll be able to put it on the reel. The advantage is that you won’t have to worry about killing your grass any longer. The Kochey Garden Hose Holder is affixed, and it holds a 100-foot hose. It’s easy to install. You have two options when it comes to installing it. You can either hang it on something or you can screw it to something use two nails. It’s durable to handle heavy hoses. Some more advantages is that the holder doesn’t rust, and it’s portable. The holder is made out of steel, and it can withstand years of use and hot temperatures. This reel is compact. It won’t take up much space. The reel is white, but you can always paint it if you’d like. If you paint it, it may rust afterward. Even though this product has many advantages, it also has many disadvantages. This holder isn’t retractable, so it doesn’t do the work for you or help you. Another disadvantage is that the holder has extremely sharp edges, so you may cut yourself, or it may cut your hose. If you have a long hose, the Ames Estate Hose Wagon may be the best hose reel for you. This hose reel can hold a 400-foot hose. The hose reel is made out of steel. It has four wheels so that you can easily move it with you as you water your garden. The wheels are made out of rubber, which makes moving it easier compared to plastic or metal wheels. The hose reel weighs 49 pounds. The weight of the hose reel shows you how durable this product is. If you click on the link, you’ll see that the hose reel has a handle. While it doesn’t do all of the work for you, it will help. All you have to do is use the handle to easily wrap the hose around the reel when you’re done watering. The Liberty Bronze Garden Hose Reel holds a 125-foot hose. The product is constructed out of cast aluminum with brass and aluminum plumbing fixtures. It has a durable powder coat finish. The company claims that the hose reel won’t rust. A handle is attached to the hose reel to make it easier to use. All you need to do is use the handle to wind it back up after you finish watering. It’s also easy to pull out your hose before watering as well. If you need a shelf with your garden hose reel, this may be the perfect product for you. A shelf is attached over the garden hose reel to put anything you need there. It’s ideal for garden tools and nozzles. This gardening hose reel isn’t portable. It has to be affixed to an object using screws. Unfortunately, the mounting hardware isn’t included with purchase. The reel is already assembled, all you need to do is hang it up somewhere. The gardening hose reel comes with a limited one-year warranty. Overall, this gardening hose reel is sturdy, and it’s easy to install. You won’t regret purchasing this item. The Yard Butler is more of a hose holder than a reel. Unfortunately, it doesn’t help you wind it up for you after you’re done watering. There isn’t a handle on this. You’re expected to unwind the hose yourself. Unfortunately, this item isn’t portable. You’ll need to hang it somewhere using screws. This item eliminates crimps, kinks and tangles in your hose. This item is durable, and it’ll hold your hose without the hose sagging because of its strong construction. This item will keep your hose organized and neat. It’s important to mention that this gardening hose reel has a lifetime warranty. A lifetime warranty is hard to find with other gardening hose reels. If you ever need materials for this hose reel or a replacement, you can simply call the company. If you click on the link, you’ll notice that it doesn’t say how long of a hose this reel will hold. This product is made out of metal, so it’ll likely hold long and heavy hoses. It isn’t flimsy at all. You may want to contact the company, and ask them how long of a hose this reel will hold. The company also doesn’t include if this gardening hose reel will rust or not. This garden hose reel is made out of aluminum. It has a brass swivel. The reel comes with a 10-year warranty. It can hold a 150-foot hose. If you click on the link, you may notice that a hose and nozzle is in the picture. Unfortunately, these items aren’t included with purchase. Another disadvantage is that assembly is required if you purchase this item. According to the company, this hose reel has a new braking system with comfortable grip handles. It also has a heavier brass swivel. This item has a large frame, which may be an advantage and disadvantage. The advantages is that it’s sturdier and more durable. The disadvantage is that it’ll take up a lot of room wherever you store it at. You may not have the room for it. Some more advantages is that the reel is elevated so that you don’t have to reach down far to use it. This is helpful for people who have back or other health issues. The reel has a handle you can use to unwind or wind the hose. According to the company, this reel won’t rust, and you don’t have to worry about it tipping over. The Liberty Garden Wall Mount is a decorative way to store your hose. To use this garden hose reel, you’ll need to hang it on something. It holds a 125-foot hose. This item is made out of cast aluminum to ensure a sturdy hold. According to the company, it doesn’t rust. It also has a durable powder coat finish that the company claims can handle the weather. Even though the company says that this item can handle the weather, it seems to fade after months in the sun. This garden hose reel is easy to install. Unfortunately, you’ll need to buy mounting hardware separately because it isn’t included with purchase. Some more disadvantages about this product is that it doesn’t have a handle to help you unwind and wind the hose. You’ll have to do this manually. Another disadvantage is that it isn’t portable. The Quality choices garden hose holder can hold a 150-foot long hose. Unfortunately, this item isn’t portable. You’ll need to hang it on something with screws. The hose reel is sturdy. It’ll hang on any object without any issues. Unfortunately, the company doesn’t mention if hardware is included with purchase. If you decide to purchase this garden hose reel, you’ll get the adjustable nozzle included in the picture for free. You also have the option of choosing a green, bronze or black color. It can be hard to install this item because of the location where the holes are placed. It can be difficult to maneuver while installing because of its construction. This garden hose reel can hold a 150-foot hose. This item isn’t portable, and you’ll need to screw it to an object such as a wall. Unfortunately, mounting hardware isn’t included. The biggest concern about this product is the fact that it’s made out of plastic. Plastic garden hose reels have been known to crack and split. An advantage is how this product has an opening to help with holding things. If you click on the link, you’ll notice that this item is a taupe color. This means that the color is between brown and gray. Depending on your tastes, you may or may not like the color. Since the item is made out of plastic, the product will become brittle because it can’t handle the sun. This may happen in just a few months or years. If you want this to last a long time, you may want to consider putting it somewhere that has plenty of shade. Even if the sun doesn’t hit it, since it’s made out of plastic, it may still break and fall apart from the weight of the hose. Some other disadvantages about this item is that there isn’t a handle to help you unwind and wind the hose, and it’s difficult to install. If you click on the link, you’ll see that the holes for the screws are in an awkward location that makes it hard to install. As you’ll notice, this product has more disadvantages compared to advantages. If you’re looking for a sturdy garden hose reel, you may want to look elsewhere. Unfortunately, the company doesn’t mention how long of a hose this item holds. This is probably one of the biggest disadvantages about this item. This item is also made out of plastic. The company says that it’s constructed with ABS material, but the sun may cause this item to crack, split and fall apart especially if you leave it in direct sunlight. The company claims that it’s sturdy. The color of this mount is green. According to the company, you won’t need any tools or hardware to install this item. This item isn’t portable, so you’ll need to hang it on something for easy use. If you purchase this item and it falls apart, it does come with a 12-month manufacture warranty. If you have any issues, you’ll need to contact the company directly or contact the seller on Amazon. If you need a gardening hose reel as soon as possible, you’ll need to look elsewhere. For some reason, this item ships within one to two months after purchase. This garden hose reel can hold a 175-foot hose. The biggest disadvantage is that this item is made out plastic. It may or may not hold up well. The reel is portable, and it has a storage area under the reel. Some more advantages about this item is that it has a handle to help you wind and unwind your hose. Since the reel is portable, you can move it, but you’ll need to be careful. The cart only has two wheels. Since the cart only has two wheels, it can be hard to keep its balance while moving it. After you move the cart, it does have a leg lock for stability. This item is light green and gray. Another advantage is that you can fold this cart up and store it anywhere there’s room. It can save a lot of space wherever you place it. You also don’t have to worry about mounting it to something. All you have to do is press a button for it to fold. If you decide to purchase this reel, you may want to consider going to Ames’ website to see if you can order it from there so that it can be shipped faster. You also may want to call them, and ask them about shipping times. The shipping time on Amazon could be incorrect. We choose the Rapid Reel garden hose reel cart as the winner. The best advantage about this product was the warranty that comes with it. If anything goes wrong with it, you can exchange it or have the parts replaced. Not only that, but the warranty doesn’t expire for 10 years. During this review, we couldn’t find a garden hose reel that compares to the Rapid Reel garden hose reel cart. No other product is sturdy and stable like this one. It’s easy to move, and it has an aluminum construction. We wouldn’t recommend purchasing a plastic garden hose reel. Plastic seems to fall apart easily, and it doesn’t last. If you don’t want to purchase the Rapid Reel garden hose reel cart, you should consider a garden hose reel that’s made out of metal and sturdy materials.